Each year, orcas leap through the air for a handful of fish, and dolphins are ridden by human performers as if they were water skis. Employees at marine parks like to tell audiences that the animals wouldn't perform if they weren't happy. You can even see how content the dolphins are--just look at the permanent smiles on their faces, right? But what most visitors to marine parks don't realize is that hidden behind the dolphin's "smile" is an industry built on suffering. Killer whales, or orcas, are members of the dolphin family. They are also the largest animals held in captivity. In the wild, orcas stay with their mothers for life. Family groups, or "pods," consist of a mother, her adult sons and daughters, and the offspring of her daughters. Each member of the pod communicates in a "dialect" specific to that pod. Dolphins swim together in family pods of three to 10 individuals or tribes of hundreds. Imagine, then, the trauma inflicted on these social animals when they are ripped from their families and put in the strange, artificial world of a marine park. Capturing even one wild orca or dolphin disrupts the entire pod. To obtain a female dolphin of breeding age, for example, boats are used to chase the pod to shallow waters. The dolphins are surrounded with nets that are gradually closed and lifted into the boats. Unwanted dolphins are thrown back. Some die from the shock of their experience. Others slowly succumb to pneumonia caused by water entering their lungs through their blowholes. Pregnant females may spontaneously abort babies. Orcas and dolphins who survive this ordeal become frantic upon seeing their captured companions and may even try to save them. When Namu, a wild orca captured off the coast of Canada, was towed to the Seattle Public Aquarium in a steel cage, a group of wild orcas followed for miles. In the wild, orcas and dolphins may swim up to 100 miles a day. But captured dolphins are confined to tanks as small as 24 feet by 24 feet wide and 6 feet deep. Wild orcas and dolphins can stay underwater for up to 30 minutes at a time, and they typically spend only 10 to 20 percent of their time at the water's surface. But because the tanks in marine parks are so shallow, captive orcas and dolphins spend more than half of their time at the surface. Experts believe this may account for the collapsed dorsal fins seen on the majority of captive orcas. Dolphins navigate by echolocation. They bounce sonar waves off other objects to determine shape, density, distance, and location. In tanks, the reverberations from their own sonar bouncing off walls drives some dolphins insane. Jean-Michel Cousteau believes that for captive dolphins, "their world becomes a maze of meaningless reverberations." Tanks are kept clean with chlorine, copper sulfate, and other harsh chemicals that irritate dolphins' eyes, causing many to swim with their eyes closed. Former dolphin trainer Ric O'Barry, who trained dolphins for the television show "Flipper," believes excessive chlorine has caused some dolphins to go blind. The United States Department of Agriculture closed Florida's Ocean World after determining that over-chlorinated water was causing dolphins' skin to peel off. 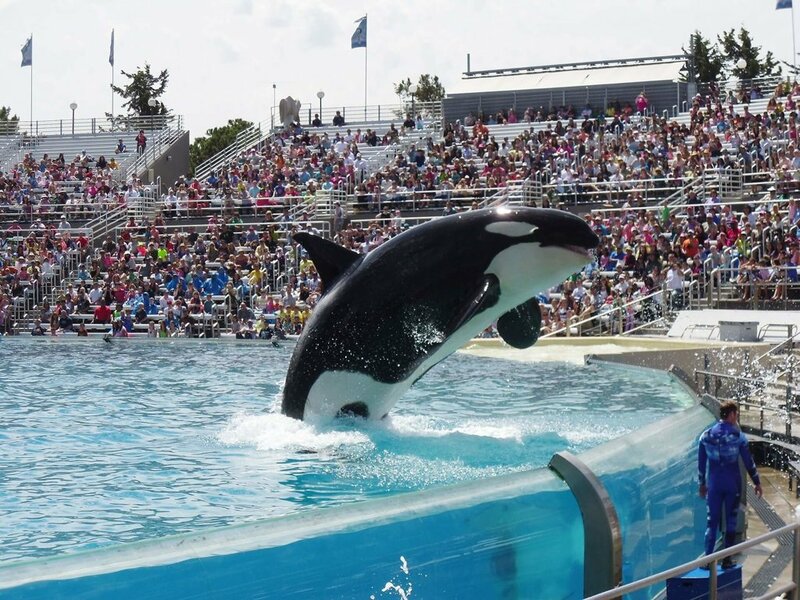 Newly captured dolphins and orcas are also forced to learn tricks. Former trainers say that withholding food and isolating animals who refuse to perform are two common training methods. According to Ric O'Barry, "positive reward" training is a euphemism for food deprivation. Marine parks may withhold up to 60 percent of food before shows so that the animals will be "sharp" for performances. Former dolphin trainer Doug Cartlidge maintains that highly social dolphins are punished by being isolated from other animals: "You put them in a pen and ignore them. It's like psychological torture." It's little wonder, then, that captive orcas and dolphins are, as O'Barry says, "so stressed-out you wouldn't believe it." The stress is so great that some commit suicide. Jacques Cousteau and his son, Jean-Michel, vowed never to capture marine mammals again after witnessing one captured dolphin kill himself by deliberately crashing into the side of his tank again and again. If life for captive orcas and dolphins is as tranquil as marine parks would have us believe, the animals should live longer than their wild counterparts. After all, captive marine mammals are not subject to predators and ocean pollution. But captivity is a death sentence for orcas and dolphins. In the wild, dolphins can live to be 25 to 50 years old. Male orcas live between 50 and 60 years, females between 80 and 90 years. But orcas at Sea World and other marine parks rarely survive more than 10 years in captivity. More than half of all dolphins die within the first two years of captivity; the remaining dolphins live an average of only six years. One Canadian research team found that captivity shortens an orca's life by as much as 43 years, and a dolphin's life by up to 15 years. Sea World, which owns most of the captive orcas and dolphins in the United States, has one of the worst histories of caring for its animals. After Sea World purchased and closed Marineland, a Southern California competitor, it shipped the Marineland animals to various Sea World facilities. Within a year, 12 of them--5 dolphins, 5 sea lions, and 2 seals--were dead. The following year, Orky, a Marineland orca said to be the "world's most famous killer whale," also died. Because of such high mortality rates and because captive breeding programs have been highly unsuccessful, marine parks continue to capture orcas and dolphins from the wild. Captive animals are not the only victims of these "circuses of the sea." Sea World patrons were stunned when two orcas repeatedly dragged trainer Jonathan Smith to the bottom of their tank, in an apparent attempt to drown him. Trainer Keltie Lee Byrne was killed by three Sea Land orcas after she fell into the water with them. Marine parks have shown no more interest in conserving marine mammals' natural habitats than they have in educating audiences. In fact, the industry has actively lobbied to keep small cetaceans, such as orcas and dolphins, outside the jurisdiction of the International Whaling Commission (even though this would help protect these animals in the wild) because they don't want to risk not being able to capture additional animals in the future. Increasingly, people around the world are recognizing that dolphins, orcas, and other cetaceans do not belong in captivity. Canada no longer allows beluga whales to be captured and exported. In Brazil, it is illegal to use marine mammals for entertainment. In England, consumer boycotts have forced all the marine parks to close. Israel has prohibited the importation of dolphins for use in marine parks, South Carolina has banned all exhibits of whales and dolphins, and other states are currently working on legislation to prohibit the capture or restrict the display of marine mammals. Richard Donner, coproducer of the film "Free Willy," has joined a growing number of people in calling for an end to the marine mammal trade. Says Donner, "Removal of these majestic mammals from the wild for commercial purposes is obscene....These horrendous captures absolutely must become a thing of the past." Boycott all forms of animal entertainment. Contact your local, state and federal officials and encourage them to ban marine mammal parks. Educate others on the issue.